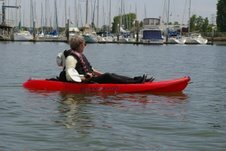 Meg, ever the safety-oriented, cautious adventurer, suggested we refurbish our kayaking skills before we begin this summer’s planned visits to some of the San Mateo coast’s most isolated and infrequently visited spots. 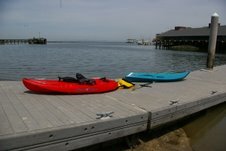 Though I think of kayak skills as being in the bike-riding, never-gonna-forget category, I agreed that with my long-lasting “tennis elbow” problem, a good workout, where White Sharks, pounding surf, and jagged rocks weren’t relevant, would be a good idea after almost a year’s layoff. We settled on Bair Island, in the Redwood City baylands, as our destination. Using the spacious free parking lot and the boat launching dock (also free), we were soon waterborne. It was what I consider a pedestrian paddle, though no walking on water was involved. The highlights on the trip were the various birds, Great Gray Herons, egrets, and a Peking-Mallard mixed race couple, along with the unusual, very valuable boats, docked along the sloughs. I had my camera jammed in my kayak’s watertight compartment, but was never willing to risk taking it out for any particular shot. I joked about that during the paddle, only to change my mind in the last hundred yards before docking. An old oil? pumping facility? lining the slough, had a row of wooden pilings that were highly effected by their long-term stint in the salt water environment. 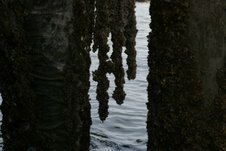 They’d been replaced by newer concrete pilings but not removed. They were wonderfully eroded (one of my strong interests, as you know), and I couldn’t resist taking my camera out of its safety spot and shooting a bunch of pictures. Perseverance in the face of natural forces is something I find interesting and always admirable. 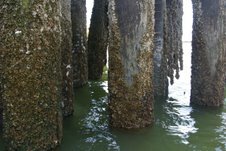 I’ve attached a few pictures of the trip and the pilings. This entry was posted in John Vonderlin. Bookmark the permalink.